Find accommodation in Bukarest Appartments. EastComfort dispose of 50 quality apartments in Bukarest, sorted by price, number of guests or by our recommendations. View our list of apartments and choose one. 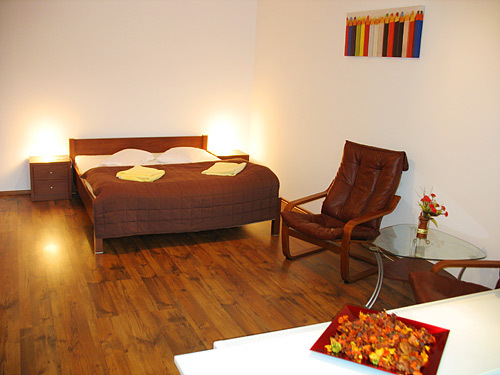 The studio apartment is located near Alba Iulia Square and Decebal Blvd. Highly furnished, the studio comprises a night corner (double bed, a large wardrobe) and a day one (2 armchairs and a coffee table).The kitchen is well-equipped to cook and dine in. The bathroom includes glass lavatory hands, bathtub and shower fixture. Even if you stay just one night in Bukarest, you'll spend a nice time in here.